Pre-clinical development (or non clinical study) refers to the process through which investigational drugs are subjected to extensive laboratory testing (in vitro and in vivo testing) to determine safety profiles, so that risks to human subjects are minimised or eliminated completely. 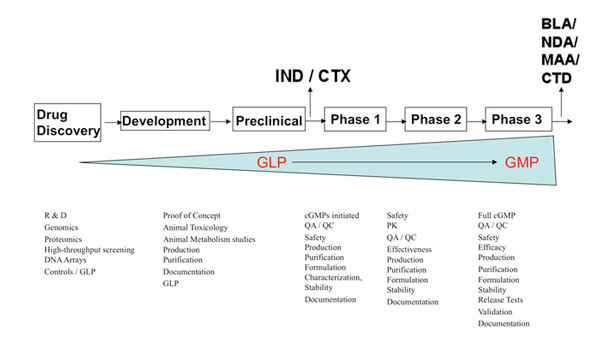 This stage of pharmaceutical development can take between one to five years and provides information about the pharmaceutical composition of the drug, its safety, how it will be formulated and manufactured, and how it will be administered to the first human subjects (during clinical trials). New Product Registration is required before this stage can take place. Medical Devices, that do not have a drug moiety, are not required to undergo pre-clinical testing and instead undergo GLP testing for safety assessment of the device and its components. Some medical devices will also undergo biocompatibility testing to show whether a component of the device, or all components, are sustainable in a living model. The Regulatory Agencies are required by law to review specific tests, documentation, and results before granting approval to begin the next stage: clinical testing in humans. Thought is also given to Technology Transfer and Validation Master Plans at the pre-clinical development stage, along with developing Quality Systems. Although not formally required until the later Clinical Development stages, development of Quality Systems and Quality Controls can help to refine and speed up their implementation, when they become a formal requirement at Clinical Phases III and beyond. • Preparation of documentation – SOPs, Reports, Licence sections, Protocols, Master Validation Plans, etc. For more details on Pre-Clinical Development please contact us.